When you stock up at the Bostrom Farms store, remember to grab something to wash it all down! 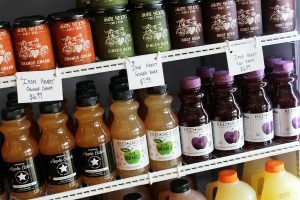 Quench your thirst with locally grown and made cold-pressed juices and premium apple ciders by Red Jacket Orchards. Live more on the edge? We carry ice cold Iron Heart craft soda, by War Horse Brewing Co., part of Three Brothers Wineries & Estates.